BBC: Dafne Keen takes on the lead role of Lyra, the young protagonist of the story who lives in Jordan College, Oxford. Placed there at the request of her Uncle, Lord Asriel (James McAvoy) she lives a sheltered life amongst the scholars and college staff while under the watchful protection of The Master (Clarke Peters) and Librarian Scholar Charles (Ian Gelder). Lyra is subsequently thrown into the nomadic world of the boat dwelling Gyptians – Ma Costa (Anne-Marie Duff), Farder Coram (James Cosmo), John Faa (Lucien Msamati), Raymond Van Geritt (Mat Fraser), Jack Verhoeven (Geoff Bell) and Benjamin de Ruyter (Simon Manyonda) who take her North in her quest. Jack Thorne (Harry Potter and the Cursed Child, This is England ’88) is a Bafta, Tony and Olivier Award winning screenwriter and playwright. Framestore takes the role of VFX creative partner on the show: managing and executing VFX throughout, and working closely with the production team to ensure the awe-inspiring work can be achieved on budget, and on time. Since first publication in 1995 of Northern Lights, the three books have been acclaimed worldwide and have won many awards. In 2001 The Amber Spyglass was the first and only children’s book to win the Whitbread (now Costa) Book of the Year Award, in 2007 Northern Lights won the Carnegie of Carnegies and in 2005 Pullman was awarded by the Swedish Arts Council, the children’s literature equivalent of the Nobel Prize, The Astrid Lindgren Memorial Award. Nicholas Hytner’s stage production of His Dark Materials was produced in two parts at the National Theatre in 2003-4. In 2006 New Line released a film of The Golden Compass starring Nicole Kidman, Daniel Craig and Dakota Blue Richards as Lyra. Bad Wolf is a UK/US production company founded by Jane Tranter and Julie Gardner and co-sited in South Wales and Los Angeles. The company is responsible for co-producing award-winning The Night Of for HBO and A Discovery Of Witches for Sky One. His Dark Materials is New Line Cinema’s first move into British television. 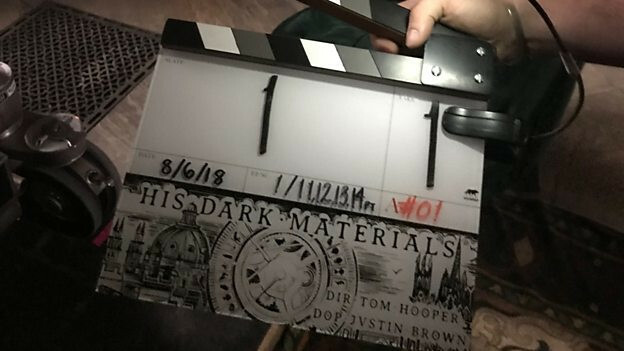 His Dark Materials will be Executive Produced by Dan McCulloch, Jane Tranter and Julie Gardner for Bad Wolf, Philip Pullman, Jack Thorne, Tom Hooper, and Deborah Forte, Toby Emmerich and Carolyn Blackwood for New Line Cinema, and Ben Irving and Piers Wenger for BBC One. BBC Studios is the international distributor for His Dark Materials.